It’s that time of the year folks-summer scents are dropping. Bond No 9 is launching its latest in the Andy Warhol series, Montauk. Named after the little town on the end of Long Island and the place Warhol loved to retreat to when escaping downtown New York, it will make its debut Memorial Day. This by far is my favorite in the Warhol series. From the sunset bottle design, which is from a series of screen prints he created in 1972, to the bright, slightly sweet and salty opening, this unisex scent is an ideal accessory for a summer’s night of fun. It’s not to heavy, citrusy or aquatic like other typical summer scents. There’s a nice balance and the dry down is where the sensuality begins. 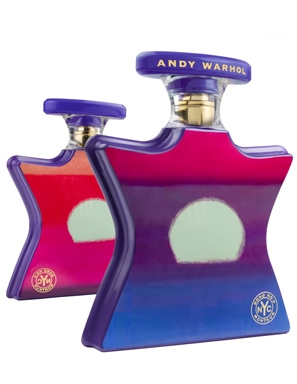 This entry was posted in Fragrance Review and tagged Andy Warhol, Bond No 9, Men's Colgone, Men's Fragrances, Men's Scents, New summer scents, summer scents. Bookmark the permalink. Ok, love the bottle. Now I must go into the store and smell this…I’m dying of curiosity!